In this luminous story, two journalists from National Geographic on assignment in Indian Country cross an invisible boundary between two worlds, two different visions of reality -- and find their lives transformed. 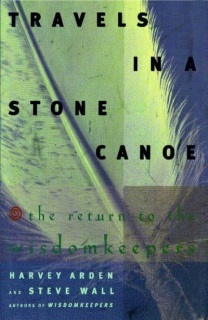 In a stunning and probing narrative -- part adventure tale, part reflection and epiphany -- the authors of Wisdomkeepers embark on a dramatic "spirit journey" into the living wisdom of Native American spiritual elders.When, nearly twenty years ago, a darkly enigmatic Cherokee herbalist approached Harvey Arden and Steve Wall with the proposition that they join him in a study of the lives, wisdom, and spiritual practices of Native America's fast-disappearing "Old Ones," the veteran writer and photographer found themselves thrust, despite their own hard-nosed skepticism, onto a mystic "path of the Wisdomkeepers." After receiving "signs" foretold by the Cherokee, they set off on a journey of spiritual discovery through another world, called Great Turtle Island, where the Old Ones -- the Wisdomkeepers of aboriginal culture in North America -- bestowed upon them piece by surprising piece a set of "rules for being human" called "Original Instructions." Arden and Wall eventually left their Geographic careers and journalism altogether, and in 1990 produced an interim report on their spirit journey, their now-classic international bestseller Wisdomkeepers: Meeting with Native American Spiritual Elders. In that book they recalled, "We went out two journalists after a good story. We came back two 'runners' from another world, carrying an urgent message from the Wisdomkeepers. This book is that message." Now, in Travels in a Stone Canoe, that message is further deepened and elaborated as the authors reveal the intensely personal story behind -- and beyond -- their journey to the Wisdomkeepers. A final, incandescent chapter, "Original Instructions," sums up the transforming and highly practical wisdom they found. "Wisdom," they learned, "is not something you believe. It's something you do." This is a story that will inform, enlighten, and move every reader who accompanies the authors in their Travels in a Stone Canoe.